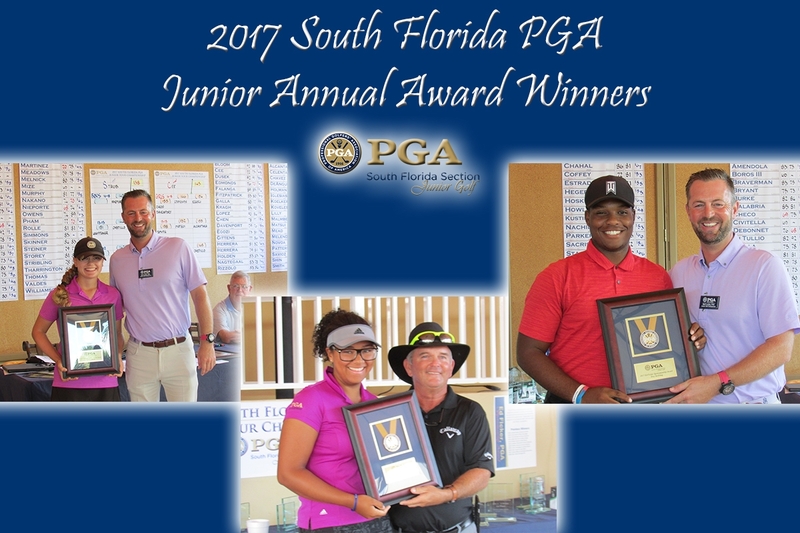 December 13th 2017 - ATLANTIS, Fla. – The South Florida PGA Junior Tour annually awards juniors for their dedication on and off the golf course. For the 2017 season, one male and one female were each selected for the Honda Classic Most Improved Player, one male and one female were each selected for the Ed Ficker Sportsmanship Award, as well as one Junior selected for the newly created Don Law Service Award. Hannah Foster of Hobe Sound was selected as the 2017 recipient of the Don Law Service Award. At the age of 17, Hannah put her name into the American Junior Golf Association Leadership Links to help in raising funds to support the SFPGA Foundation and the programs it administers. This year, Foster raised nearly $1,300 in support the South Florida PGA Foundation. Foster has been a South Florida PGA Junior Tour player since 2012. She is beloved not only by her family and friends on and off the course, but has also impacted the staff and PGA members through her journey with the South Florida PGA. The Don Law Service Award was created to recognize junior golfers who demonstrate leadership, character and community service through their involvement with the South Florida PGA Foundation as well as other charitable endeavors. The Don Law Service Award honors someone who has a desire to give back to their community and be a role model to others. Madisyn Bloom of Wellington was selected as the 2017 female recipient of the Ed Ficker Sportsmanship Award. Bloom was selected for her dedication to the game of golf, and her outstanding etiquette on and off the golf course. Bloom will be attending Florida Golf Coast University in 2018 to pursue her dream of becoming a PGA member. Troy Stribling of Jupiter was selected as the 2017 male recipient of the Ed Ficker Sportsmanship Award. Stribling is known for being one of the longest hitters on the golf course, and an outstanding gentleman on and off the course. Stribling always treats volunteers, facility staff and spectators with the upmost respect. Taylor Caradonna of Boca Raton was selected as the 2017 female recipient of the Honda Classic Most Improved player. Caradonna had an incredible season, finishing runner up at the South Florida Junior PGA Championship and capturing the inaugural South Florida Junior Open. Caradonna managed to improve her scoring average over 5 strokes since the 2016 season. Cameron Owens of Wellington was selected as the 2017 male recipient of the Honda Classic Most Improved Player. Owens had the most impressive improvement to his game in 2017 after improving his scoring average nearly 7 strokes since 2016. The SFPGA Junior Tour presented by The Honda Classic is a membership-based tour open to boys and girls ages 11-18 in South Florida with the aspirations and skill levels to compete at the High School and Collegiate level and features some of South Florida's most talented junior golfers. The Junior Tour offers twenty-five two day championship events for junior golfers in South Florida. The 25 events are divided between the Championship Tour, an invitational tour featuring extended yardages, and the Challenge Tour. The South Florida PGA Junior Tour is proudly presented by The Honda Classic and supported by Antigua, Club Chef, Don Law Golf Academy, Junior.Golf, Lipman Produce, Natalie’s Orchid Island Juice Company, Palm Beach County Sports Commission, Power Crunch, Pukka, The Men’s Fun Group at Mirasol, Skimp, Titleist, Florida Institute for Performance and TLINK Golf. The South Florida PGA Junior Tour, run under the South Florida PGA Foundation, is committed to its mission of keeping membership and tournament-related costs low while providing first-class quality golf at twenty-five championship courses throughout South Florida over the course of the entire Junior Tour season.